Sarah:100% Disneyphiles. If it deals with Disney we need to be apart of it and know about it. As DVC members we always have a trip (or two planned. Sarah: We both grew up on Disney. Our families both took trips each year and so when we met we continued building on that number of trips together. I don’t think there was ever a doubt in our minds when we got engaged that we would be returning to say I do. We actually had no other locations in consideration; it was Disney wedding or bust. 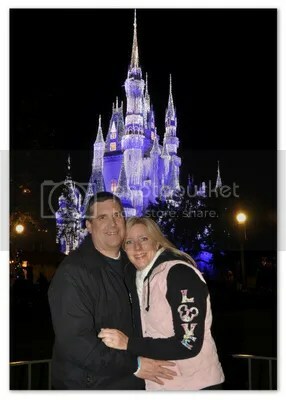 We knew having a wedding in Walt Disney World meant it got that Disney seal of quality and magic. Sarah: I don’t think many people were shocked when they heard the news. We had gotten engaged there and as soon as we decided on a wedding there we began telling people to save up for a destination wedding. We were lucky and were not met with much resistance on the traveling. Our families were very supportive and they are all Disney fans themselves. Sarah: The wedding and reception venues were givens for us. We were getting married in the heat of a Floridian summer so we needed an indoor location. 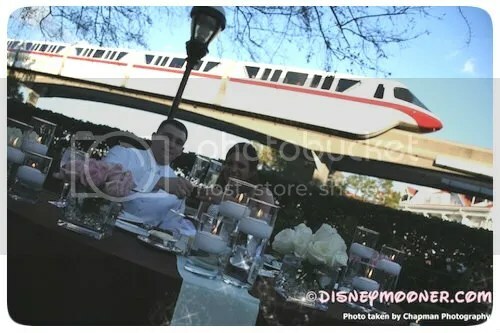 I always dreamed of having a wedding at the Wedding Pavilion, with every monorail ride overhead. The Living Seas decision was made 2 years prior on the Behind the Scenes Tour at Epcot. Part of the tour shows you this private room in the Living Seas. As soon as our tour guide mentioned couples could have their receptions there, our eyes met and the decision was done. Sarah: Planning the wedding from a distance was a touch stressful at times, but the planning session and constant communication with my wedding planner really helped ease all the anxiety for me. I think it was a really surprise for us to see everything come together. You see it all piece by piece for so long, that it’s hard to see the grand picture of how the centerpieces will look on those tables under that lighting. We were really blown away by how well Disney took our ideas and brought them to life. I remember the biggest moment for us was seeing our reception for the first time. Sarah: I think I was really surprised at how the adults reacted to our three characters at the reception. We had Mickey, Minnie and Stitch at our reception and the look of excitement and awe really captured us. To see these giant smiles on the faces of grown men and women dancing with Mickey was priceless. Sarah: It’s really hard for me to name just one aspect that our guests loved. There are a few things that they still talk about. I think the guests were really taken back by the Dessert Party at Italy Isola and the private area for Illuminations. They really felt like they were celebrities that night being escorted back stage to a private area just for them. Sarah: Our Illuminations Dessert Party. Looking back I don’t think our wedding would have been the same if we didn’t have that event after the reception. It was a final farewell to our guests who traveled so far for us. It was the perfect ending to an amazing day. Had characters at our reception. The look of pure exhilaration on the faces of the youngest to the oldest as they danced with Mickey Mouse and Stitch at our reception was priceless. Had a few group events prior to the wedding. 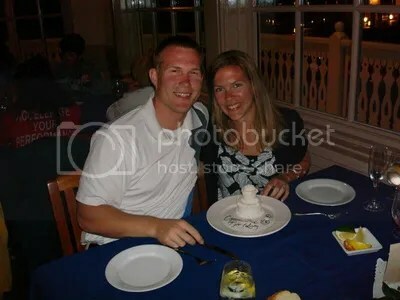 We had our rehearsal dinner and a night out at Pleasure Island a few days before. I was so thankful for those special moments with our friends and family. I found myself wanting more of those moments during the trip. Surprised our guests twice. We hired Major Domo to play a prank on our guests during the ceremony. No one knew what was going on and really thought our best man had lost the rings. The story is still told to this day with big laughs. We also surprised everyone with the lighted slipper sorbet at our reception. Everyone thought that was the greatest addition. Sarah: Looking back in the weeks and months after the wedding there wasn’t really anything I would have done differently. We were so happy with the event from start to finish, I can’t imagine changing anything. Now that almost 6 years have passed I think there are so new trends and additions I could have added had they been an option. I think if given the chance now I would have done an Epcot photo shoot after the wedding. Sarah: There were a ton of photos I had on my must list. I even made a detailed list of top 20 pictures that MUST be taken and handed it to my photographer. He was great and carried it around all day to make sure he got all of them. If I had to pick one…they were the fireworks shots from our dessert party. Those are still some of my favorites. However, I did find that some of my more cherished ones were the unexpected ones taken. Sarah: Plan the wedding you both want, not the wedding you think other people want. We really did plan the wedding we both envisioned. Sure we took others into consideration but the wedding venues, style, theming, music, ceremony, etc were all us. And for those brides ready to walk down the aisle, my advice to every bride that I have seen off over the years. Take a mental picture. At some point on your wedding day stand off to the side and look around at everything around you. Take in the sights and sounds and the people around you. The day goes by lightning fast and you will be happy you took a few precious moments to be in the moments, once its all over. Disneymooner Lesley, and her fiance Tyler, will be having a Wishes wedding on September 2, 2012 at Disney’s Wedding Pavilion at the Walt Disney World Resort. They will be having their reception at the Grand Floridian Salons. Lesley: Tyler & I are high school sweethearts we have been together for 8 years. Our first trip together was to Disney with multiple trips between then and now which have increased our love for Disney. I am finishing up my second bachelor’s degree in nursing (yes it is possible to plan your dream wedding in nursing school!! ); Tyler has a great job with a Cement company right out of college as a logistics analysis. Disneymooners:When did you first decide you wanted to have a Disney Fairy Tale Wedding and why? Lesley: When I was little and traveling to Disney with my family (growing up we went 2-3 times a year) I always said I would get married at Disney. 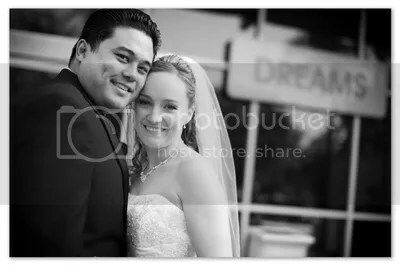 In 2006 Tyler and I took a picture outside the wedding pavilion, at that time having little meaning he knew that was where I wanted to get married. In 2011 he proposed to my at Narcoossee’s and while walking around the park the next day with our just engaged pins on we saw multiple just married pins. We stayed on the boardwalk and as we were on our balcony we saw a couple who had just got married walking in their wedding attire, we yelled “congratulations” to them. It was at that point I think we both though why not, lets finish our happily ever after and get to have that moment where everyone is going to be looking at us!! Disneymooners: Did you have any concerns about having a destination wedding? If so, what were they and how did you work them out? Lesley: Our biggest concern at the start was getting his family down there. My family and extended family use to take trips together to Disney for graduations/birthdays and it has been awhile since our last family trip so we knew my side would not be a problem. His family has never even been to Disney so I thought this was a perfect opportunity for them to join us in our happily ever after while enjoying a family vacation. I am finishing up nursing school, so I didn’t want to be doing a lot of planning so we knew a destination wedding was the right choice for us. Here towards the end, we are still working out a lot of the kinks to get family members down there but I know our day will be perfect and in the end our love ones will be there! Disneymooners: Any special reason why you chose these locations? Lesley: I always wanted to get married in a church so the wedding pavilion just fit our personalities and look. At first we wanted our reception at the Wilderness Lodge or Boardwalk. After finding out the WL didn’t have a reception location we looked at both boardwalk and GF at our site visit and to me it was an easy decision. The Grand Floridian to me has always been so appealing to the eye so it was a no brainer once I saw the reception locations and the convenience of the location in regards to the WP (No, offense to anyone having a reception at BW – I still love it there and would have it there if the WP was closer). Wedding Pavilion – like I mentioned above we knew if we were having a DFTW it was going to be at the pavilion. The construction did throw me off but past brides have reassured me that guest will not solely be focused on the outside aspect. Dessert Party – we thought this would be a perfect “favor” for our guest. We are having our DP at Fantasmic! A little different then the typical illuminations but it has always been one of our favorite shows. Minnie & Mickey – we want to surprise our guest with some honoree guest. I think deep down people think they will be at the ceremony so they aren’t coming into the reception until later. Potato Martini Action Station – I love mashed potatoes so when I saw a past bride describe her upcoming wedding menu items I knew that I would also have to include this on mine!! Lesley: Trying to get everyone down there. We recently found out a group of our friends are coming which we are very excited about but then a few of our family members we thought for sure would be there have declined. Another challenge for me is transportation, even though Disney offers park-resort transportation Disney’s options does not seem to fit our budget, timeframe or guest count. Lesley: Don’t be afraid to look outside of Disney. We are going outside to get Floral and Transportation. In the end we are still saving money. I used these boards as a way to gain knowledge from past brides experience’s with outside vendors. Also, don’t be afraid to ask questions to past brides, we all know the stress involved with planning a wedding and sometimes a question you think is “silly” will help you in the long run of planning. Also, be persistent with your budget and let your planner know if you think something is too expensive. For example, my cake came back at $17pp and I told my planner “no we were not going to have it cost that much for cake”. In the end I think it’s now down to $9pp using a 2-tiered cake (instead of 3) and sheet cake (after we cut it – we were told they are taking it all to the back anyways to cut, so our guest will never know). Lesley: Yes, we have everything we want for our wedding on our BEO and we are just over minimum. It was important for us to stay around minimum as we are lucky enough to have someone pay for it. We know that it is costing a lot for our friends and family to come down so we kept that in mind too and have tried coordinating a lot of “free” activities for them such as a welcome party (rehearsal dinner) instead of limiting it to our wedding party only. Disneymooners: You have a Planning Journal in progress here, have you found that to be helpful in your journey? Lesley: Yes, the planning journal is the best choice I made as it helps answer a lot of my questions that I have instead of bothering my planner. It also helps me gain insight as to what other brides are doing/have done which leads me to look into it for my big day. Disneymooners:What are you most looking forward to on the big day? Lesley: Marrying my best friend of course. I can’t wait to see his reaction as I walk down the aisle and celebrating the whole day with our friends and family (it is an all day affair). Also, I can’t wait to have the moment where guest are congratulating us (like we remember from our previous trips). Lesley: Take a deep breath and enjoy planning it will fly by. Try not to stress on the little things because the day of I know I’m going to look back and think I was crazy for fretting over it. Feel free to ask questions because my experience with past brides is where I get the best information and ideas!! Lesley, on behalf of all of us, I’d like to thank you for taking the time to share your experiences so far. We are so happy you have joined Disneymooners and we are so excited to follow your planning. Wishing you a wonderful planning journey and a beautiful wedding! All the best ~ Disneymooners.